Today's challenge is to write a poem for May Day or to give a poetic account of a celebration that was. Today is May Day's Eve. Whether you know May Day as a worker, union member, politician, pagan, Christian or another tradition, it is a day to celebrate loudly. Yet at various times and places in history one or the other of these celebrations was dangerous. You may know it from music or poetry, Mendelssohn, Goethe, or Tennyson. 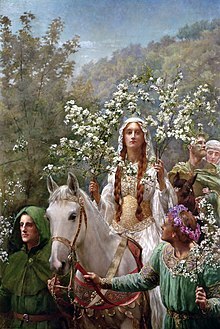 Here are links to Wikipedia's general information on May Day folk celebrations (like Walpurgis Night) and International Workers Day. To spy some secret scandal if he might ..."
from Idylls of the King: "Guinevere" by Alfred Lord Tennyson (1859). For me the day marks the end of the poetry challenge for the month of April, the first steps to plans I made all winter and the beginning of What. Is. Next. 1. Post your new poem on your site, and then link it here. Good Morning, Poets United! Here it rains and rains. I hear the wind and the green things swaying and gulping down their drink. Whence a smokeless incense breathes. . . .
A hint of change ... yes. Happy day, Jae. Thank you for taking part in our challenge. It fits here beautifully because of what May Day is to you. Love the bonfire. Thank you for participating in this challenge. I haven't written the good-bye poem yet, but I've already written and posted at the Garden. This may be a three-poem day. Rain gives me license to play, and today I am full of gratitude. Ah! Always good to see you, Sumana. Wonderful prompt, Susan. Here, it is a teensy bit chilly still but I have my doors flung open. Your prompt sent me in the direction of my Irish roots, plus memories of bonfire leaping in Tofino. Yay! Great! Love Irish roots. And Tofino sounds more and more attractive. Good night, Poets. I'll be back in the morning on May Day itself. Looking forward to more poetry reading! HI thank ypu for the prompt just got round to my small offering, best wishes to all. Your small offering is HUGE.